What a difference a day can make, particularly when oil futures are this volatile. Shares of Camber Energy (NYSEMKT:CEI), Crescent Point Energy (NYSE:CPG), Ensco plc (NYSE:ESV), and Nabors Industries Ltd. (NYSE:NBR) are all down by double digits on Dec. 27 as of 2:01 p.m. EST as crude oil makes a big move downward. At this writing, Brent and West Texas intermediate crude futures are down 3.2% and 2.7%, respectively. Oil prices have been incredibly volatile in recent trading days, and almost entirely with a lack of market-specific news, as investors react to general economic concerns that have swung stock markets in similar ways. In addition to today's big decline, we saw a big jump on Christmas Eve -- oil's biggest single day in years -- which followed one of the biggest single-day declines in crude prices since the Global Financial Crisis on Dec. 20. This whipsaw action is playing havoc with oil stocks, particularly with smaller companies with big exposure to oil price movements. For instance, Camber Energy recently did a reverse split of its stock simply to get it out of penny territory as the company deals with continued negative cash flows and minimal sources of new capital. CEI Cash and Equivalents (Quarterly) data by YCharts. Crescent Point is a small Canadian-focused oil producer, and Canadian oil benchmarks are down even more than Brent and WTI crude prices on the day. With a substantial amount of its production coming out of Canada and potentially facing higher transport costs to get it to refiners, Crescent Point's realized prices can be even lower than benchmark prices. Then you have Ensco and Nabors, two drilling contractors. Ensco provides offshore drilling platforms to oil producers, while Nabors leases land-based rigs to drill onshore oil and natural gas. Since neither of these companies participates in the sale of the oil or gas drilled with their equipment, higher or lower prices don't directly impact them. But they do see an indirect effect. If we go back to early 2016, when oil prices bottomed out, demand for both off- and onshore drilling equipment was crashing, with producers doing everything they could to cut their costs, including terminating equipment and service contracts as soon as possible. Furthermore, 2016 and early 2017 was an absolutely awful time to be in the drilling business, with demand at some of the lowest levels in decades. The result was an extremely high number of drilling rigs sitting idle, costing companies like Ensco and Nabors money to keep them in working order but providing zero incoming revenue. But as oil prices crept up over the past two years, drilling activity -- especially the onshore work that Nabors' equipment facilitates -- increased. So that's the indirect benefit and the reason why traders are selling these two stocks on today's decline. Frankly, I think investors would do well to avoid both Camber Energy and Crescent Point, as well as the vast majority of their small, independent producer peers. This is a hard business to consistently make money at, and oil prices (which have proven notoriously hard to predict) tend to drive the stock price. Most importantly, many independent producers struggle to generate positive cash flows when oil prices fall -- and a lot don't make money when oil prices are high -- living off stock sales and issuing debt to fund ever-expanding drilling operations. Ensco and Nabors, while still likely to remain volatile, are at least worth consideration. Both trade for solid discounts to the book value of their assets, and both have proven that they can make money. 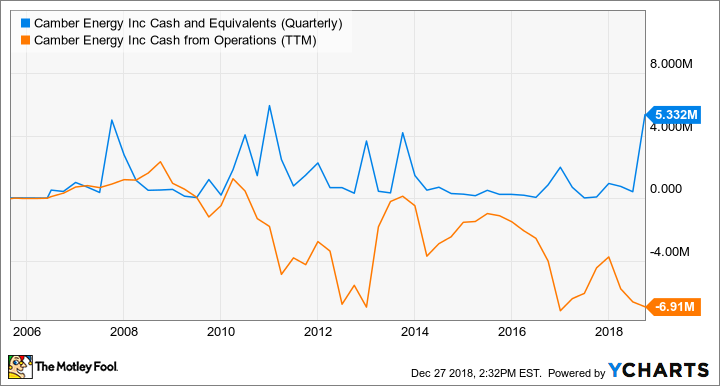 Furthermore, both companies also have relatively solid balance sheets, with a mix of cash and available credit that should support their needs if things get ugly. However, there's still risk to consider. Ensco has already taken substantial writedowns to its asset value as it scrapped old vessels and may take even more actions that would drive down its book value. Nabors hasn't been so aggressive with its older drilling rigs, despite the likelihood that it probably should eliminate a large number of older rigs that cost it money to maintain but won't see the oil fields ever again. But if it's a risk-return investment in the oil patch you're looking for, both Ensco and Nabors should make for far better choices than Camber Energy and Crescent Point, because the market has already "priced in" a near-worst case for both, while their underlying businesses should remain viable even if oil prices continue to fall in the short term.